Off the Northeastern U.S. lies one of the most productive ocean regions on the planet—a hotspot for marine life, abounding in everything from microscopic organisms at the bottom of the food chain to sharks, turtles, whales, and commercial fisheries at the top. What’s sustaining such an abundant marine ecosystem and what could change it? To figure that out, you need to take the long view, said Heidi Sosik, a biologist at Woods Hole Oceanographic Institution. The reasons that drive changes in ecosystems aren’t going to be obvious in just one season, or even from one year to the next. “When you’re concerned with long-term trends, you need long-term observations,” Sosik said. That is where something called the Long Term Ecological Research (LTER) program plays a critical role, Sosik said. Funded by the National Science Foundation (NSF), the LTER program aims to support ongoing studies of ecosystems that are important for the environment and for society, not just for two to five years—the length of a typical science research grant—but for decades. The NSF created the program in 1980 at a handful of strategic locations. Over time, it has expanded to a network of almost 30 sites, including forests, deserts, coral reefs, and other diverse ecosystems in the continental United States, Alaska, Antarctica, and islands in the Caribbean and Pacific Ocean. This spring, the NSF added several more sites to the LTER network—including the Northeast U.S. Shelf (NES) off New England. Along the coast, relatively fresh, cold water flows down from the Arctic, colliding with saltier, warmer water carried northward by the Gulf Stream farther off shore. The different densities of the two water masses creates an underwater frontal system along the “shelf break” at the edge of the continental shelf, where it begins to slope steeply to the deep ocean. Nutrient-rich waters upwell to the sunlit surface along this shelf break front, fueling the phytoplankton that spur the food web’s abundance. Sosik, who studies microscopic plants and animals known as plankton, is the lead scientist for the project, working with WHOI fish biologist Joel Llopiz, ecosystem modelers Rubao Ji and Mike Neubert, physical oceanographer Steve Lentz, and biologist and information manager Stace Beaulieu. The team also includes scientists at the National Oceanic and Atmospheric Administration’s National Marine Fisheries Service, Wellesley College, the University of Massachusetts at Dartmouth, and the University of Rhode Island. NSF has funded the new NES-LTER with a $6 million grant for five years, renewable in six-year increments. The overarching goal of the project will be to understand and predict how plankton that make up the base of marine food webs are changing in response to changes in their environment over time and throughout the region, Sosik said. She and her collaborators will also investigate how changes in the plankton affect the small fish that eat the plankton and the larger fish, marine mammals, and birds that eat those fish. Detecting long-terms trends in something like water temperature can take many years of measurements, Sosik said, because gradual changes can be masked by short-term variability. But NOAA’s Jon Hare said many signs of change are already apparent along the coast of the U.S Northeast. “The Northeast shelf ecosystem is one of the fastest-changing ecosystems in the global ocean,” said Hare, who directs NOAA’s Northeast Fisheries Science Center. Temperatures are increasing over the long term. The chemistry of seawater is changing, including increasing carbon dioxide concentrations, which is causing ocean acidification. There are changes in the composition of phytoplankton and zooplankton. And many fish species are shifting or extending their distribution northward, he said. The NES-LTER team will be delving into the mechanisms driving those changes and attempting to understand how different parts of the ecosystem affect one another. WHOI scientist Rubao Ji, for example, will use models to make connections between biological and physical processes over time, comparing patterns now to patterns in the past, and trying to make projections for the future. To model those connections, Ji will need lots of data. 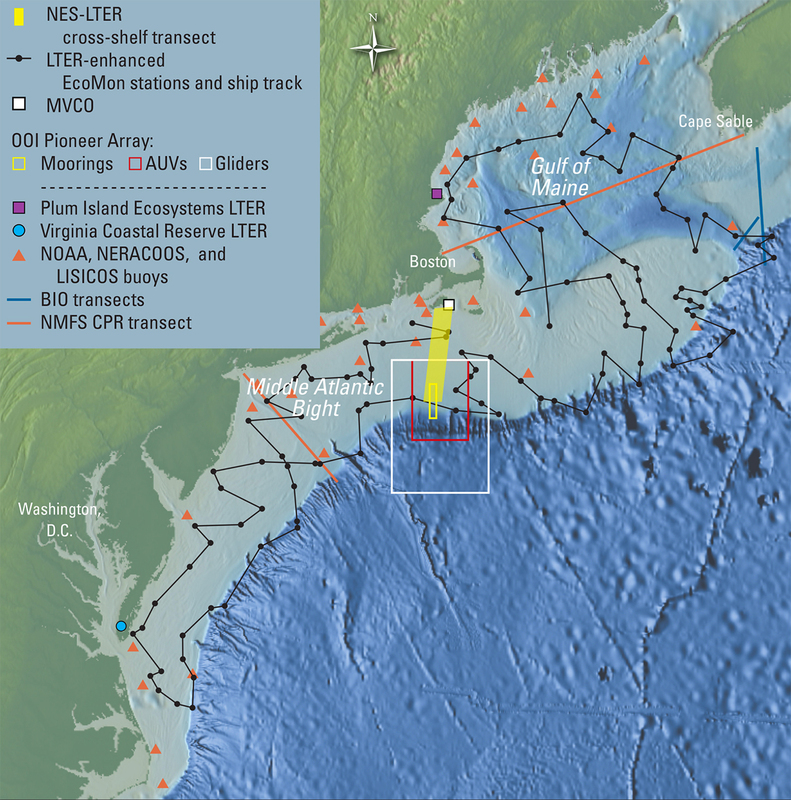 The NES-LTER will build on monitoring and research at two existing installations on the borders of the new NES-LTER study area: WHOI’s Martha’s Vineyard Coastal Observatory (MVCO) and the Ocean Observatories Initiative’s (OOI) Coastal Pioneer Array. 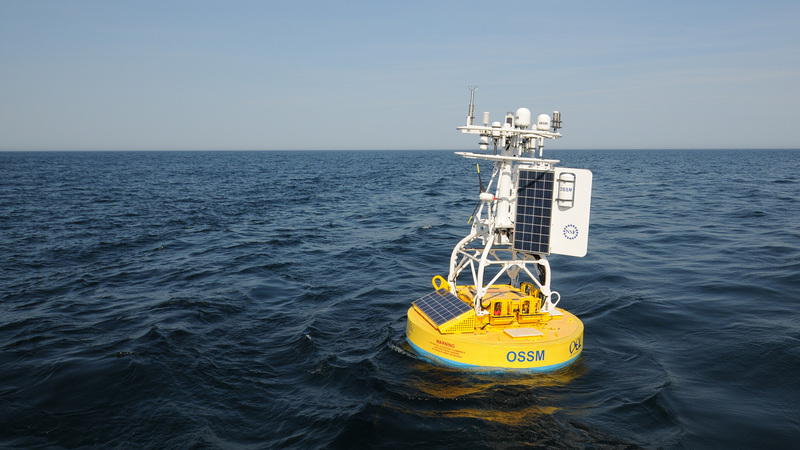 Located near Edgartown, Massachusetts, the MVCO includes an underwater node into which scientists can plug instruments to monitor ocean conditions. The node is connected by underwater cable to a small shore lab. 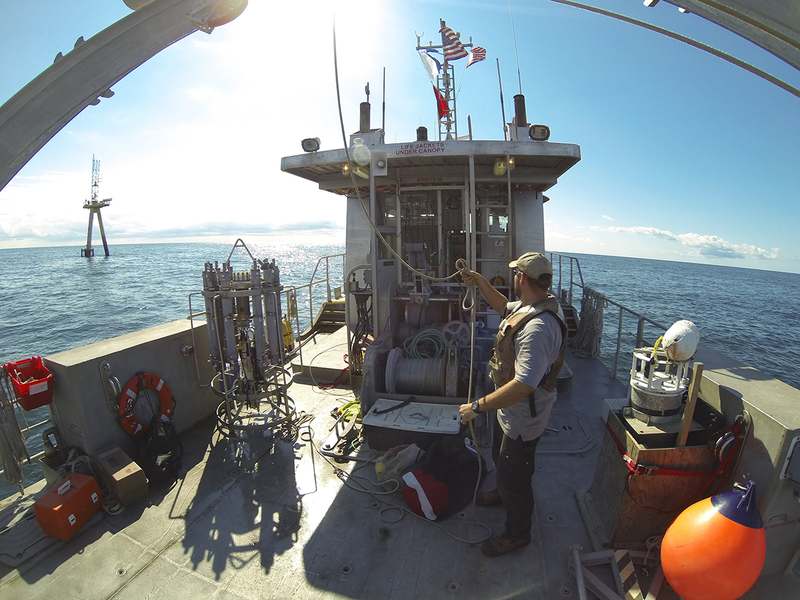 NES-LTER researchers are taking advantage of the power and high-speed communications available through the cable at MVCO to deploy underwater microscopes and other optical sensors to make detailed measurements of plankton. 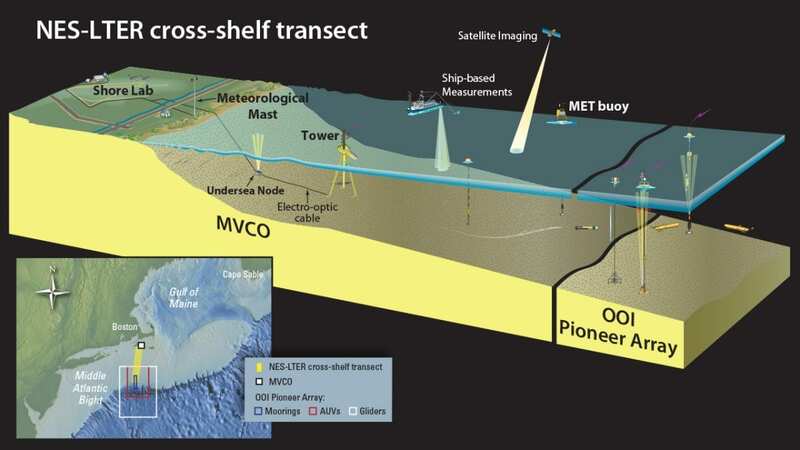 MVCO also includes a meteorological mast and an air-sea interaction tower, whose instruments measure wind speed, currents, temperature, and other physical characteristics of the atmosphere and seawater. About 90 miles south of Cape Cod, the Pioneer Array consists of ten anchored moorings at seven locations spanning the edge of the continental shelf, with instruments gathering meteorological information and measuring oxygen, temperature, salinity, and other properties from above the sea surface down to the ocean floor. In addition to integrating data already being gathered at those sites, the NES-LTER team will conduct four research cruises a year through the study area, using imaging systems and other instruments to assess phytoplankton and zooplankton populations, and mass spectrometers to measure gases and track production within the food web. They will also collect plankton for genetic analyses. The collaboration with NOAA will allow the team to take advantage of data collected on four NOAA Ecological Monitoring cruises that extend from Canada to Cape Hatteras, as well as two trawl surveys that NOAA uses to assess available stocks of commercially important fish, including flounder, cod, and haddock. All the data they collect will go into a web-based information system, enabling scientists across the entire LTER network and beyond to access them. Sosik hopes the new information and scientific understanding generated by the LTER will help inform human interaction with the ocean, such as fisheries management and wind energy production. To complement the research, the NES-LTER program will include a multifaceted outreach and education program, with opportunities for graduate, undergraduate, and K-12 students, as well as teachers and the public. Sosik envisions a valuable impact on ocean research in the region for years to come.